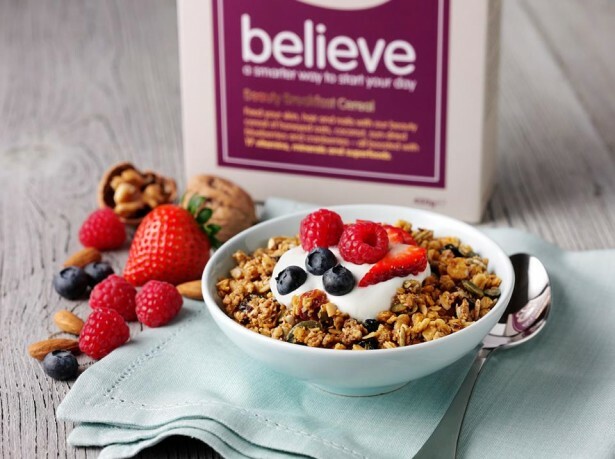 Believe Cereals is a recently new brand created by a group of cereal lovers who lead busy lives and wanted something healthy to help kickstart their day. So they created Believe Cereals which provides a real benefit to the body aswell as tasting delicious. We all know what its like when your rushing around in the morning and don’t have time for breakfast or grab the nearest sugar filled cereal bar and think that it will serve its purpose. Well I think its about time we all started treating our bodies to a healthier start in the morning. I know there are those of you that will tell me there is never time for breakfast in the morning but its up to us to make time. I’m sure we could all resist the temptation to snooze our alarms for the extra 10 minutes if it means we can enjoy a healthy and nutritional breakfast. Still not tempting you? Well why don’t you read on below to find out what believe cereals can actually do for you. The Beauty Breakfast Cereal with added 17 vitamins, minerals and superfoods is definitely a smarter way to start the day. This is the first ever cereal that combines wholesome nutrition with a boost of vitamins and minerals for radiant skin and healthy hair and nails. Who could resist saying no to that? The cereal is made up of honeyed oats, coconut, sun-dried blueberry and cranberry clusters. I have tried it just with semi-skimmed milk ( boring, I know) and it tastes absolutely delicious. The textures are just right and the blueberry and cranberry just add a bit of berry ooze to the taste.